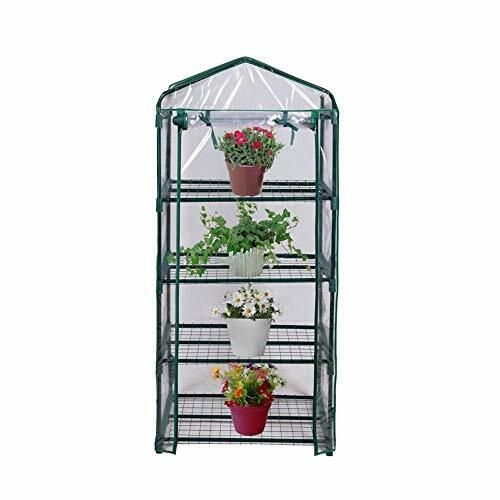 FORUP Mini Greenhouse 4 Tier, 27'' L x 19'' W x 62'' H (Green) by FORUP at Sun Light Village. Hurry! Limited time offer. Offer valid only while supplies last. Best greenhouse for cultivating seeds, young plants and rare flowers. Ideal for small space as places on a deck, patio, or balcony. The main shelves use high quality tubular steel, heavy-duty bearing net on each layer can hold more plants. The greenhouse covered totally with a clear Polyethylene cloth with two long zippers, it can be roll-up as a small door. Enjoying a lot of fun of the flowers and plants in your leisure time! If you have any questions about this product by FORUP, contact us by completing and submitting the form below. If you are looking for a specif part number, please include it with your message.